Allow me introduce you to the other half of B6182! We talked about the A-line skirt a couple of weeks ago. This top is intended for drapey woven fabrics and is a little less structured than the B6183 princess seam top, with a more relaxed fit. All the shaping is accomplished though the center-front seam and darts, both of which allow you to adjust the fit as needed and also work as a fun design detail. I’m really looking forward to sewing and wearing this one, which I just cut out using beautiful double gauze from Cotton and Steel. I think it’s going to be really comfortable to wear this summer. 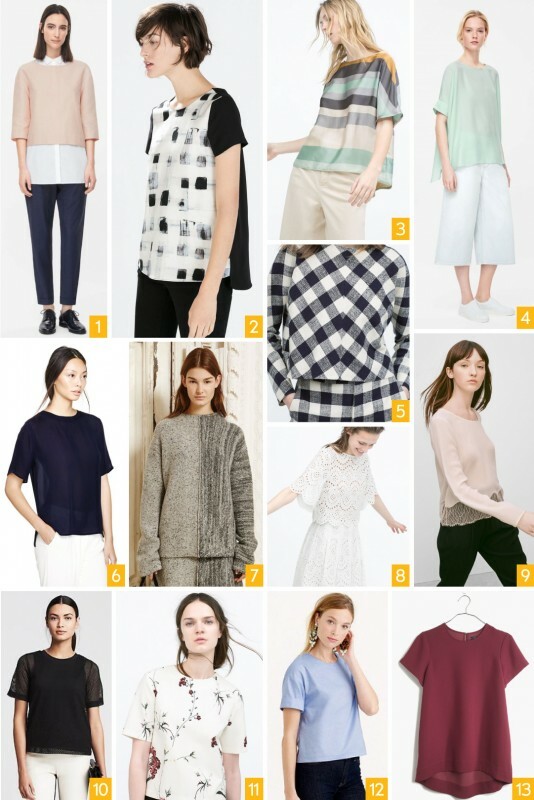 But there are so many directions you could take this pattern depending on your fabric and styling choices, ranging from dressy to very casual. Here are some ideas to get you started. 2. Pretty shade of pale pink. I’ve got a real passion for this pale peachy pink color right now. 3. Drapey denim or chambray. 4. Navy with a drawstring added to give it a casual, sporty vibe. 5. Sheer tonal stripes add a dressy feeling that would also be work-appropriate. 6. Silky navy gets that whole athleisure feeling when styled with sweatpants. Wear it with a pencil skirt for a more classic look. 7. How great is this yarn-dye check for a cute top? 8. I love the watercolor silk of this top. Have you tried hand-dying fabric yet? It’s really easy and fun to try, and you can find all the information and supplies you need at Dharma Trading. 9. What about oxford shirting with contrast sleeve cuffs? Oxford has been making a reappearance in fashion, which is great because it’s such a versatile, classy fabric. It also wears beautifully. 10. For fall or winter, try wool boucle. 1. Here’s another pale pink top layered with a crisp white shirt underneath for a more trendy look. 2. Lengthen the top a bit and color block it with a combination of printed and solid silk to get this look. 3. Love the awning stripes! 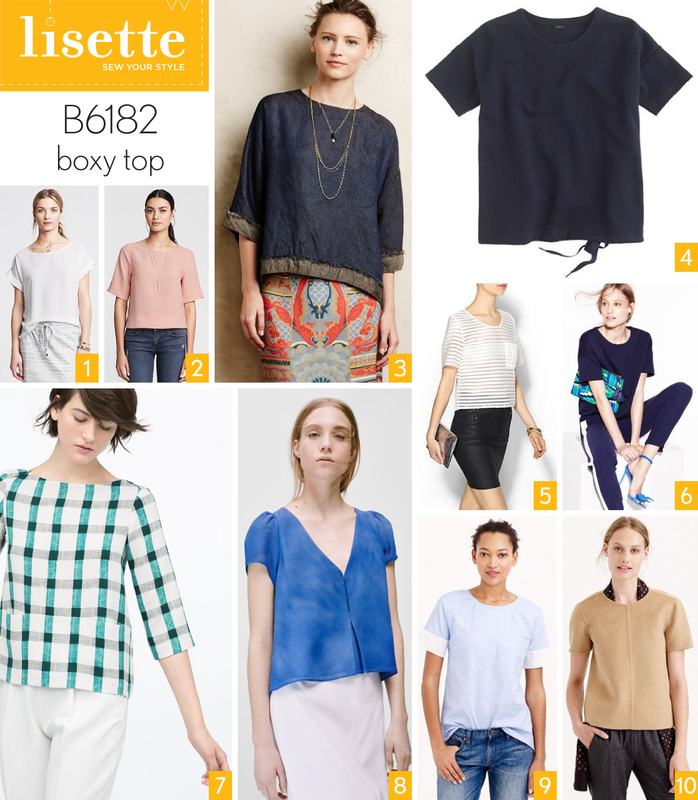 These muted colors are beautiful for spring and would be surprisingly easy to wear. 4. Try it long and slouchy in a pale mint green. 5. Aren’t these checks cut on bias fun? I really love this idea. 6. Very elegant in semi-sheer navy or black silk. It might be fun to play with textures for this top, too. What about pairing satin with sheer? Perhaps a sheer back and a satin front? 7. Fleece or sweater knit would give the pattern a completely different, slouchy feeling, especially if you lengthen the pattern. 8. Beautiful in all lace. 9. Or try adding just a lace hem! 10. 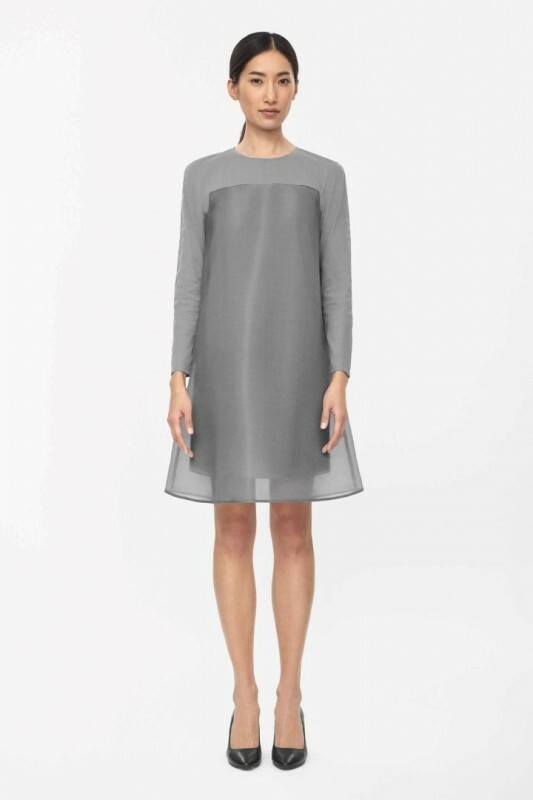 This would be fun to try: sheer sleeves with an opaque body. 11. Love the floral print on this one. 12. Crisp shirting for a menswear-inspired or tailored feeling. 13. Marsala, if you want to be on trend with the Pantone color of the year. And don’t forget the dress version, too! Isn’t this one cute? You could use a crisp cotton, too, for a casual summer dress. But I also love this dressed-up version with layers of organza. I made the both the top and dress a couple of weeks ago, and they are already wardrobe favorites. I even paired the top (which is quite cropped) with a high waisted a-line skirt yesterday and felt great in it. The dress I made in a really drapey rayon that was pretty delicate and needed a simple pattern. I put it on and thought: “I want to wear this every day!” Your patterns always make such comfortable, stylish, wearable clothes that are perfect for my active lifestyle. Thanks! Oh, I’m so glad, Robin! Thanks for the sweet comment. I hope you’ll post photos so we can see these fantastic-sounding outfits! I’d love a sew along on this one! I just made it up this week in a rayon challis. Though, I’ll certainly wear it around the house…something is not right about the sleeve cuffs? And, I didn’t get as nice of a finish as I hoped. I must have mis-read the directions but can’t quite figure out where. The darts and center front seam, I love though! Once I figure out the sleeves I’d love to make this up as the dress! I think we can probably swing a sew-along for it! I’ll add it to my To Do list for sure. And Rececca, I hope you’ll show us when you decide on your fabric! Can’t wait to see how it turns out for you. I definitely want this dress. No clue what fabric to use, yet. I’ll have to hit Britex. But, the dress is definitely the one I want!! 😀 I love the minimalist design; that’s what my “core” wardrobe is currently being built on. Beautiful, high-quality shoes with minimalist well-designed clothing. Thanks so much for this post. It’s really helpful to see all the different options. I have been looking for a babydoll/A-Line dress for a while, a bit similar to the blue one in the picture you have posted above. Do you think I would be able to make it from the pattern? The blue one looks a bit more floaty than the green and grey. Thanks for the comment, Karolin! Yes, it’s all about the fabric for this style. The floatier the fabric, the floatier the dress. I’d love to see how it turns out when you make it. Love this top! So versatile and on trend. I’m very much looking forward to making it. I just finished my first grow-up pattern: the Weekend Getaway blouse and I’m so pleased with the results!! Oh, that’s wonderful, Ana Sofia! I’m so glad to hear that you’re happy with it and planning more sewing for yourself. Hi I’d love to know what you were thinking for adjustments to fit around the centre front seam and bust dart.